For the month of May, I took an unexpected break from blogging. The reason? 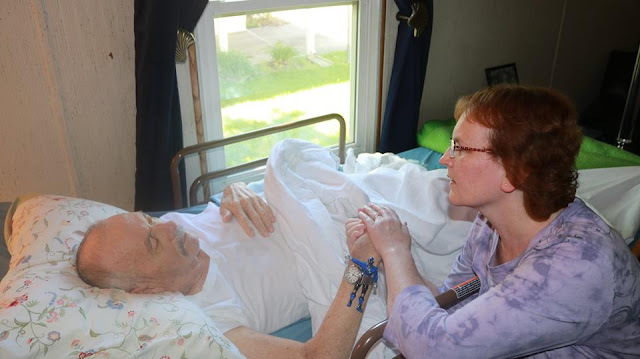 I was saying goodbye (or rather, "see you later") to my wonderful dad, and then began trying to adjust to the new normal without him here on this earth. It has not been easy but, with God's help, my family and I are slowly adjusting with the strength given to us from above. This photo was taken sometime within the 2 weeks my dad was at home in a hospice bed. Among other things, his liver was failing, and we all knew his "time" was getting closer; but, even at the end of his earthly life, it was such an encouragement to see him sharing the love of Jesus with us. As he spoke to us, we know he was trying to make sure he would be seeing his family again someday in Heaven. For example, at one point, Dad asked me directly, "What will you say to Jesus when you meet Him?" I confidently answered, "I will thank Him for saving me from my sins. And, then I will also thank Him for giving me a dad and a mom who took the time to teach me about Jesus." Although I miss my dad terribly, I have felt the prayers of others, and truly feel at peace, knowing he is in a better place, and that I will see him again someday. His favorite song by The Booth Brothers is "Look for Me at Jesus' Feet." I certainly plan on looking for him there when it is my turn to leave this world behind. I hope you will be able to join us. SIDE NOTE: In the photo you can see a little toy figurine attached to Dad's watch. When he first came home on hospice, he asked for something from one of his grandkids that he could hold next to his heart. He loved his grandkids dearly with unconditional, unending love.